Mirror (specular) reflections from the large Tablet screens can be very annoying because they are superimposed images that compete with the LCD image. Plus the eye automatically tries to focus on the distant reflected images instead of the LCD. Both of these effects cause eye strain. Because the screens are made up of multiple layers of glass and plastic they actually produce multiple reflections from light bouncing off each of the different layers. To examine the reflections we bounced a tiny 3mm in diameter highly collimated pencil beam of light at 45 degrees to the screen and photographed the reflected beams, which appear as overlapping circles in the photos below. This lets us identify and measure the different layers within the screens. Highly magnified photos from each Tablet are shown below together with a simplified diagram that outlines how it works. Each Tablet has 2 or 3 prominent reflections. The top circle is from the top layer of the cover glass. 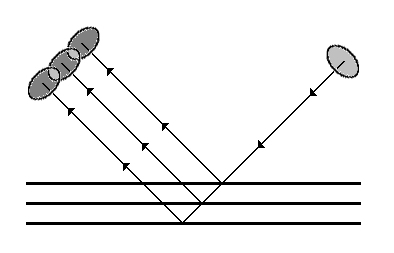 Each subsequent layer produces an additional reflected circle. The iPad 2 and Kindle Fire have the thickest screens with an internal air gap between the cover glass and the actual LCD screen. The Nook Tablet has the cover glass laminated to the LCD screen so there is no air gap and no third reflection as in the other Tablets. 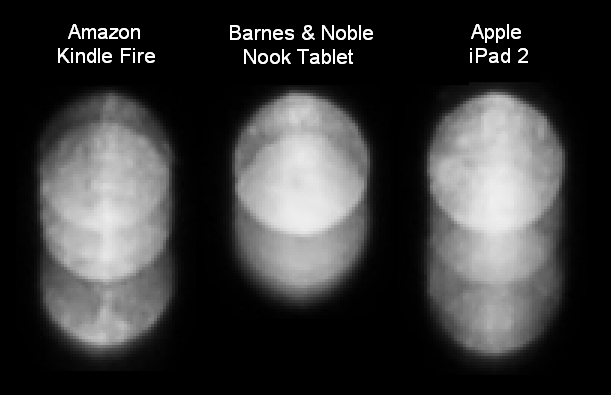 This is one reason for the Nook Tablet's lower screen reflectance. Copyright © 1990-2011 by DisplayMate® Technologies Corporation. All Rights Reserved.